Saturday I will officially receive my bachelor of science in dietetics and begin the next chapter. As a freshman I made it my goal to eventually become part of my professional association's executive board. And I did. I spent two years on exec, with my senior year as president. I was on the inside of what I loved and became close with professors and fellow students. It was a great resume builder but also a way to find my point of view about dietetics. Do become part of the clubs on your campus...but step it up. Search for things beyond the university to gain additional experiences. Volunteer in your community, or seek virtual experiences with companies. It will be some extra work but you've now become a more competitive applicant than many of your classmates. Give your school and yourself a good name no matter where you go. Dress appropriately, be on time, and try your hardest. You're in college to become a professional so act the part. As a side note, drunken pictures with your name on them can be very college...but definitely not professional. People are sadly shocked to recieve a classic handwritten thank you or contact note. You will stick with that person above those who fire off a quick email...or (please don't let this be you) don't send anything at all! If you're a stationary nut, you could have some personalized. Have an online presence. Craft an e portfolio. You could write for websites or make your own. Are you on Twitter? Companies who are hiring are! Go for a cohesive feel on your media with similar colors or icons and people will start to connect the dots. Share words of wisdom or your favorite resources with the next generation. Wouldn't you have appreciated that? People remember honesty and kindness and they will be your peers in the business world one day. The agony. And by agony I mean four semesters of various chemistry classes. It wasn't a class that came naturally to me so I WORKED. But there was a point when more studying wasn't helping and what I truly needed was a break. Don't burn yourself out, but don't blow it off. Find your balance. 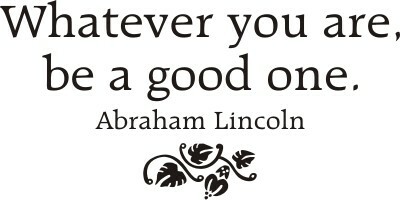 As Abe Lincoln said "Whatever you are be a good one." And as Tim Gunn says "Make it work". Share your success secrets!